Heat a pan with oil. Add finely chopped ginger and garlic, cumin seeds and let it sizzle. Add finely chopped onions and sauté till translucent. Add in the canned chopped tomatoes, red chili powder (and finely chopped green chilli optional), garam masala powder (optional), coriander powder, turmeric powder, aniseed and mix well. Cover the pan with a lid and cook over low flame for 4-5 mins till the oil separates. Add in the cashew nut powder and stir well, let it cook for 5 mins. Add frozen mixed vegetables, lemon juice, Himalayan rock salt to taste, 3/4 cup water, mix well, close with a lid and let it simmer for another 5 mins. Add Organic Turmeric Lotus Bites, simmer for a minute and switch off the stove. The Lotus Bites will absorb the water and the gravy will thicken as it cools down. If you are going to cook this curry ahead, add the Lotus Bites in, just before reheating and serve. 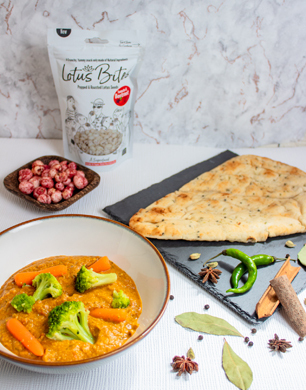 Garnish with coriander leaves and serve hot with Naan Breads or Basmati Rice and enjoy the mix of different textures of some soft Lotus Bites and some crunchy ones in a spiced gravy!